Our Special Van125 Poetry Issue (#59) was published in the fall of 2011 to celebrate Vancouver's 125th birthday. 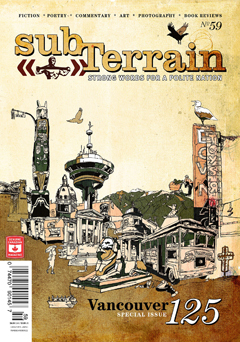 The issue is a full colour, 136-page, perfect-bound issue and features 125 poems inspired by the fine city of Vancouver. The issue includes work by Al Purdy, Earle Birney, Brad Cran, Roy Miki, Peter Mitham, Sachiko Murakami, Nedjo Rogers, Carleton Wilson, Alan Twigg, Brian Kaufman, Tom Osborne, Lakshmi Gill, Roy Kiyooka, Larissa Lai, Joanne Arnott, Renee Rodin, Daniel Zomparelli, Phillip Quinn, Ray Hsu, Patricia Smekal, George McWhirter, Sharon Thesen, Fred Wah, Phinder Dulai, Clint Burnham, Christine Leclerc, Daniela Elza, Renee Sarojini Saklikar, Tammy Armstrong, Diane Tucker, George Bowering, D.N. Simmers, Michael Turner, Rita Wong, Lyle Neff, Chris Hutchinson, Cynara Geissler, Jennica Harper, Trevor Carolan, Ryan Knighton, Jeff Steudel, Libby Davies, Calvin Wharton, Kate Braid, Oana Avasilichioaei, Gary Geddes, Jay MillAr, Marguerite Pigeon, Jen Currin, Russell Thornton, Adam Cramb, Catherine Owen, Wayde Compton, Daphne Marlatt, Rob Taylor, Elizabeth Bachinsky, Jim Wong-Chu, Alexis Kienlen, Karen Green, Heidi Greco, Malcolm Lowry, Bud Osborn, Jordan Turner, Lionel Kearns, Evelyn Lau, Mari-Lou Rowley, Gillian Jerome, Stephen Collis, Miranda Pearson, Heather Haley, Judith Copithorne, Jamie Reid, Elizabeth Ross, Howard White, Dennis E. Bolen, Suzanne Buffam, Patrick Lane, Onjana Yawnghwe, George Fetherling, Bliss Carman, E. Pauline Johnson, Mona Fertig, bill bissett, Patrick Friesen, Colin Browne, George Stanley, Billeh Nickerson, Peter Trower, Susan Cormier, Paul Pitre, Nikki Reimer, Christine Lowther, Reg Johanson, Jon Paul Fiorentino, Garry Thomas Morse, Cecily Nicholson. Essays, commentary, and investigations from Peter Babiak, Michael Turner, Betsy Warland, Michael Barnholden, Catherine Owen, Ray Hsu + Anna Ling Kaye, Clint Burnham, and Daniel Zomparelli. Cover and interior illustrations by Sooke artist Dave Barnes. Copies available while they last. We gratefully acknowledge the assistance of the City of Vancouver through the Vancouver 125 Grant program.